There are many opportunities available for adults to grow in their faith and to build frindships with fellow believers. The Seekers Sunday School class specializes in topical studies alternating with books and video series. The Pursuers class uses a team-teaching approach with various Bible Study discussion guides. There is an all-church pastor-led adult Bible study on Wednesday nights at 6:15 p.m.
Each Sunday evening at 6:00 p.m., there is a Power in Prayer session where adults gather to pray for the needs of the church and the community. 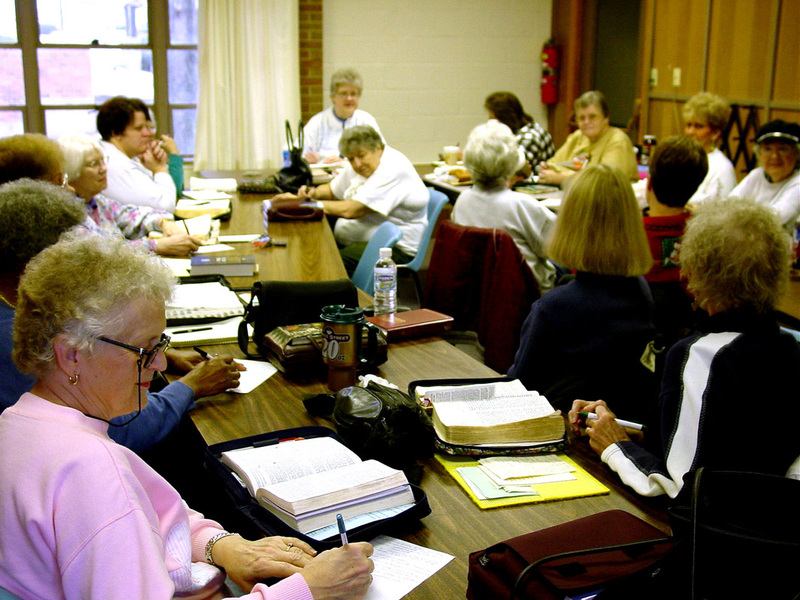 The Women's Bible Study meets every Tuesday morning at 9:30 a.m. The group enjoys several social activities throughout the year, as well. Babysitting is provided. Several small groups for women meet at various times throughout the week for Bible Study, fellowship, spiritual accountability, and prayer. Sunday Evenings from 6 - 8 p.m in the Sunday School Wing. For young adults after High School Graduation through 30 + years old. Are you looking to have a closer relationship with God in your busy life? Are you desiring God’s direction for your future? Are you wanting to explore the Bible and how it relates to you every day? Are you looking for relationships with people your own age that will build you up? Can you dance? -Jim and Jake can! Please join us for a wonderful time of fun, food, and discussion! A group of our older members which meets once a month for fellowship and planning. This group organizes various service projects and social activities for the rest of the church. Various opportunities are available for the men of the church to grow and fellowship together in the Lord. Each first Saturday during the months of October through June, the men gather for breakfast. The men do their own cooking and then stay for a time of devotions and prayer. Occasionally, the men have a Retreat at a nearby camping facility to enjoy God's creation and grow closer to Him through prayer, reflection and Bible Study. There are small groups for the men, which meet at various days and times in the week. Spurred by the Promise Keepers movement, the small groups are designed to encourage accountability and commitment in the lives of Christian men. During the summer, the men participate in a church softball league for men ages 16 and up.